Dutchman, the late Fr Adrien Schoonen, served on the SMA General Council from 1952 – 1958. He was at the same time the General Archivist. It was during this period that he undertook an intensive study of the history of our SMA Constitution. This book is the fruit of his work. For Schoonen, the Constitution was the tool on which Fr Augustin Planque, who led the Society following the untimely death of the Founder, Bishop deBrésillac, relied to govern the Society in its early years. And he considered it important that SMA members understood why the Constitution evolved in the way it did and for what purpose. Schoonen wrote his text in French and it was translated into English by the late Fr Patrick Gantly SMA of the Irish Province. The SMA Constitution saw many changes down the years. Fr Schoonen documents the reactions of some SMA members and others to these changes. Reading through this text gives us an idea of how the Society evolved over the years. Some of the issues touched on – e.g. the link between the home [Europe at the time] and the Mission [Africa] always caused tensions. But, in a spirit of collaboration, such matters were resolved. Today too tensions arise between different units of the Society. These too can be resolved in a similar spirit. 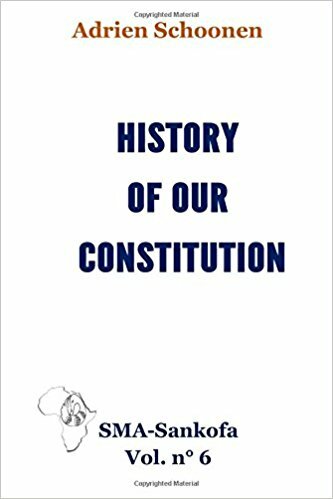 History of our Constitution is not a ‘dry, uninspiring tome’ but a lively book recounting how many different SMAs sought to make the right decisions as they saw it, the disagreements and different interpretations of various Articles…. but in the end agreement was reached. Read it and enjoy! The book can be bought on AMAZON at £4.80 plus postage. Click Schoonen Constitution for more details.